Helllllllllo and happy Monday!! You guys, I am so excited for today’s post but first can we just talk about how fast this month is going?! Really, it’s already over half way through March and I feel like the month just started. Sheesh. I don’t know if it’s going fast for you but I feel like I’m barely keeping up! 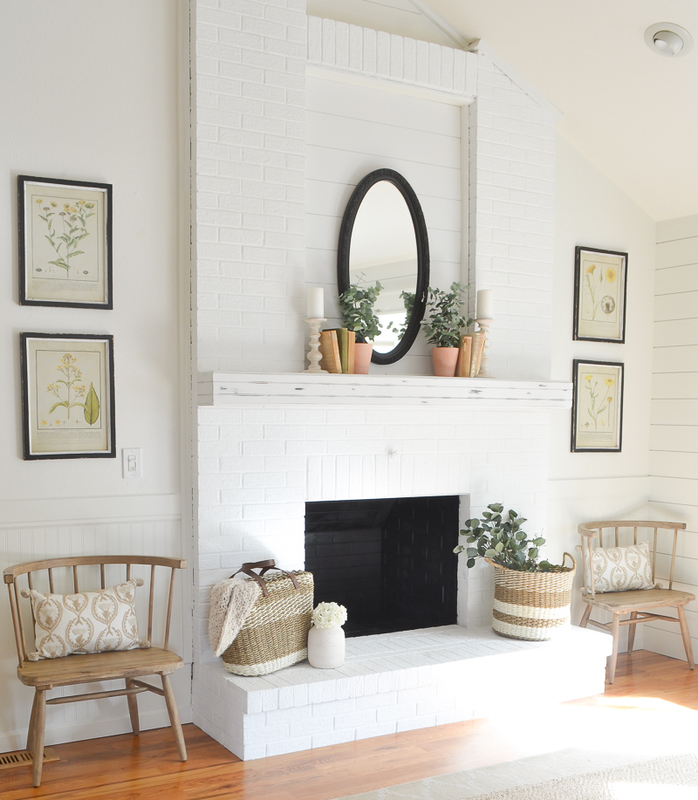 Anyway, we just finished up a little fireplace makeover and I am seriously LOVING it. 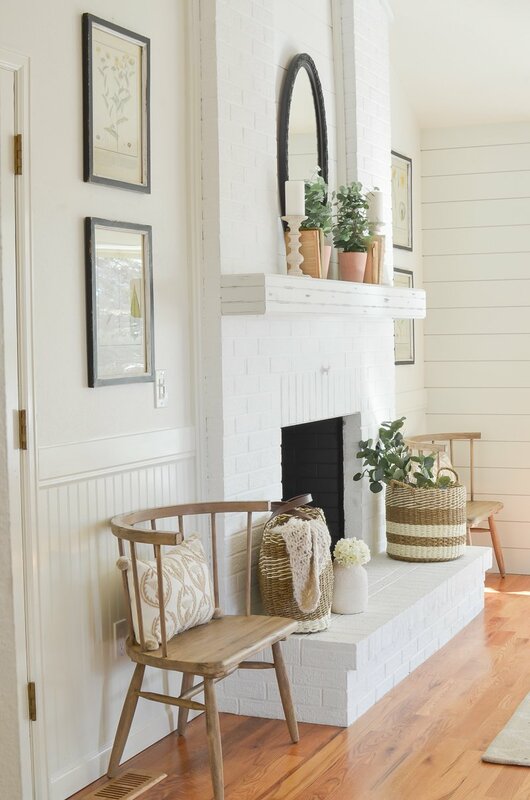 This was actually a simple project, it was really more like tweaking a few small things, but they made a big difference in the overall feel of our fireplace in the front room. And now I’m kicking myself for not doing this sooner. But better late than never, right? OK, let’s hop to it. So the first big change in this space was removing the old beadboard I had in this spot–our little “entryway” as I referred to it. We actually put that up a few years ago and I always felt like it was too high on the wall. It made styling this space kinda tricky and it always felt off to me. Anyway, I finally convinced myself it was ok to take it down and re-do it. And I’m so happy we did! We simply replaced it with a shorter piece of beadboard and trim, which instantly made this little spot feel so much better. In order to balance out the fireplace we added the same headboard and trim to the other side. It really was a simple little addition that didn’t take much time, but it helped make the fireplace feel more finished and symmetrical, if that makes sense. And how cute are those wooden chairs?! I found them at Target and I love how they have an old-school, vintage vibe. They’re perfect for these small spaces! After completing the beadboard, I also decided to paint the inside of our fireplace black. That made such a huge difference and it gave the fireplace a much more clean and classic look. I love the change! And best of all, it was really easy and fast. I plan to share how I did it very soon. 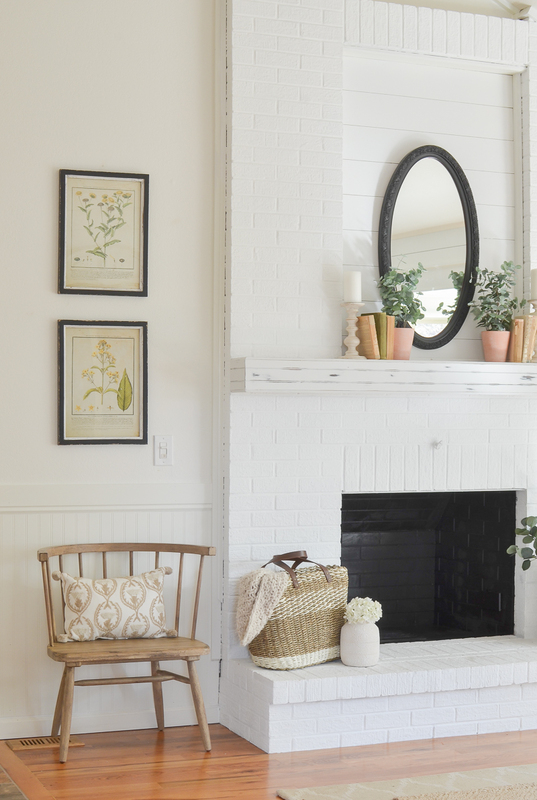 It’s crazy how just a few simple changes made this fireplace have a totally different look. Changing the beadboard and then adding more to the other side really helped this space feel more balanced. I love how it all looks now–especially with the black paint! And I gotta say–I can’t help but think about how far this fireplace has come over the past few years. Remember when it used to be yellow brick? !And our yellow walls? Eeek. She’s come a looooooong way! Where did you get the 4 botanical prints? they’re from a local shop, but you can find similar ones on Etsy! thank you Becky, I love how it all came together!! Good morning! Love the post and how fresh it looks. Unfortunately, there are no Target stores in our area that are selling the Windsor chairs!! SAD!! Same question as earlier…where are the 4 prints from? Oh that’s a bummer Vicki! 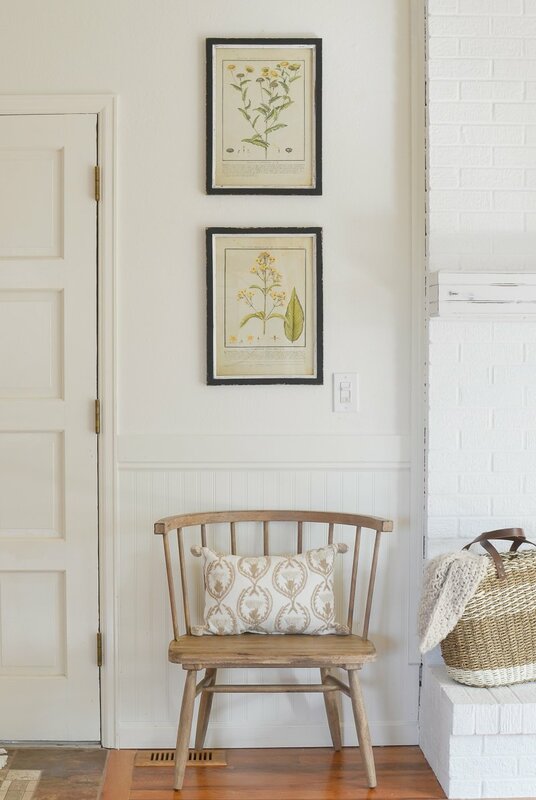 And those botanical prints are from a local shop, but etsy has tons of similar options! I love it. Simple, clean, fresh. Beautiful! Good morning!! Love all you do. I was wondering about the what finish you used with your Alabaster paint. I’m painting my diy shiplap and have struggled with a color. Love how yours looks so just wanting all the info I can get. Hi Jessica, I think it was a satin finish! Your fireplace is done so beautiful, no surprise you are my favourite designer…I just love it. Great idea with the headboard. 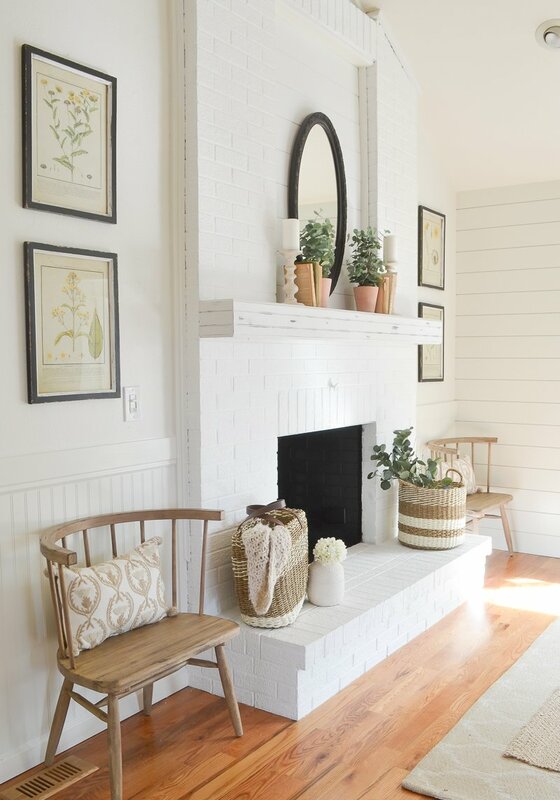 I also love the benches beside the fireplace. 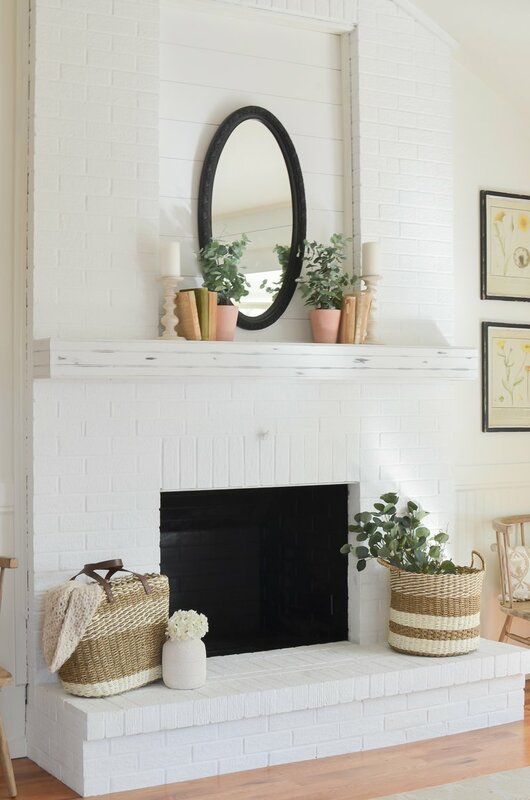 Please share how you painted inside of fireplace black!!!! I definitely will share that soon! I love it! It looks so clean and fresh for Spring! I love the mirror over the mantle and the botanical prints on each side..it gives it balance. Not to mention those great deals you found at Target on those chairs! !So pretty! Thanks for sharing another beautiful post! Love how fresh it looks. I really adore those botanical prints. 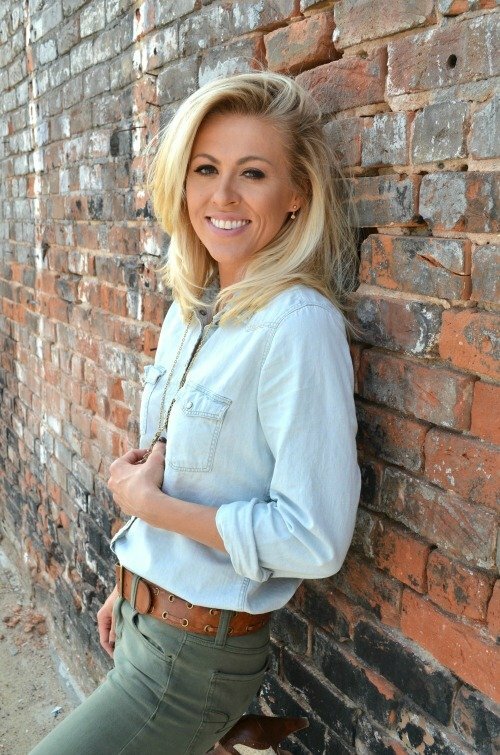 That’s awesome Sandee! I just love the way black adds a nice contrast to neutral decor. I love this little makeover so much! I’ve been waiting for you to share it since you shared on Instagram that you were redoing that panelling. Looks so good being symmetrical now with it on both sides. And I’m so jealous of those chairs. I think I may have to make a road trip to Montana just to go to Target and be able to load up the van to bring stuff home! Love those pretty pillows and the botanical prints there too! This seriously looks so much more functional!!! The cutest! Target clearance for the win! heck yes! Target always wins! yes! Can’t wait to do a spring mantel. Love the bead board and the baskets! Clean and fresh! I saw those chairs at Target and loved them. I thought about spraying it white for my front porch but thought they might be too big. They are perfect next to your fireplace. They would look good painted black, too. The fireplace loooks soooo good!!!! I looked back at the yellow fireplace when you painted it and saw the how high the wainscoting was and the other side of the fireplace didn’t have any; boy, this is such an amazing difference!!!!!! 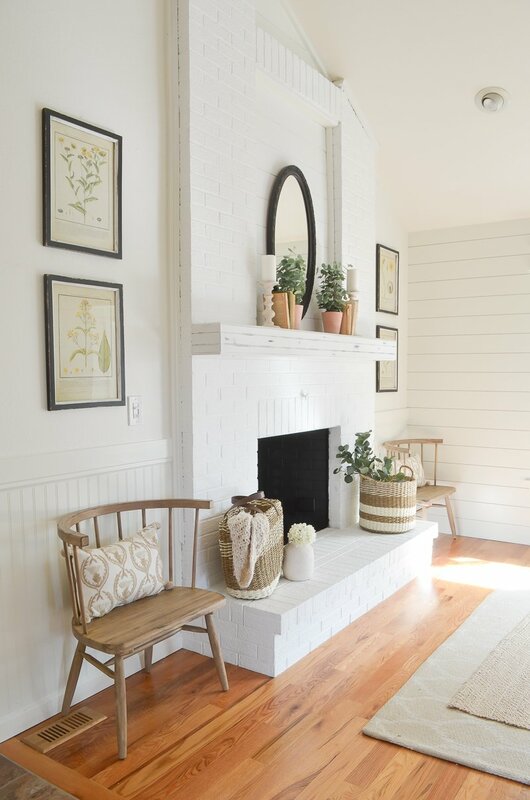 You chose wisely to paint, lower the wainscoting and I love the prints and simplicity of your mantle. Good job as always!!!! Where is the old wintage door????? You’ll have to show us where you moved it to. ahhh thanks Jean!! And you’re right, so much better than how we had it before. So glad we made this change! It looks great. 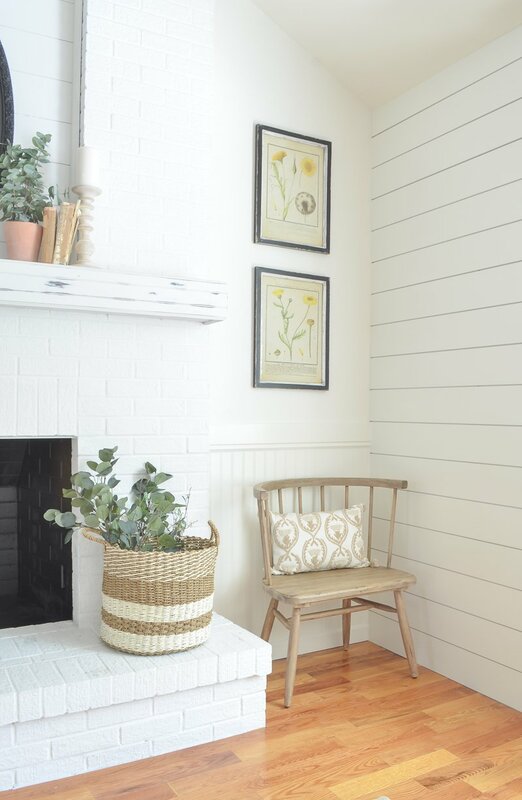 I agree that the beadboard looks much better not so high up on the wall, and adding it to the other side really makes everything more balanced and symmetrical. Looking forward to seeing how you painted the inside black. Before pics would have been awesome so we could see the difference! 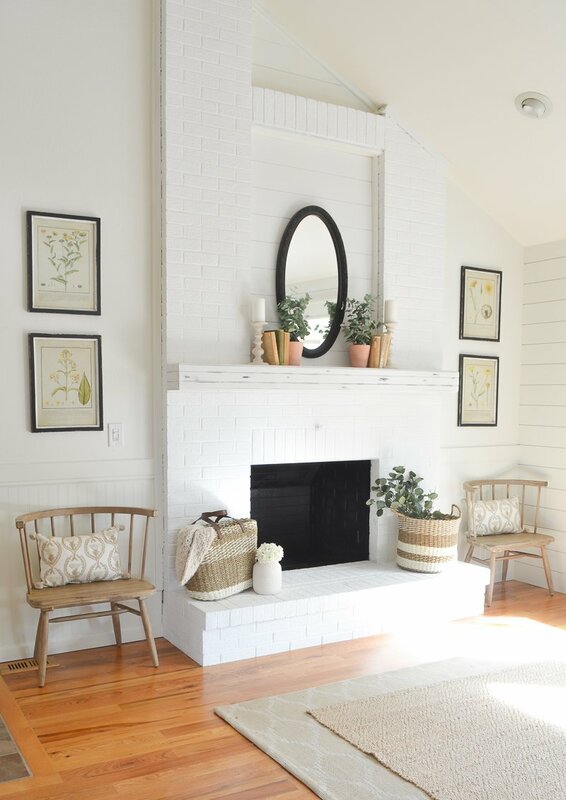 How will the black paint hold up when you build a fire in the fireplace?